Hi SciCheer fans, Samantha here! Welcome our latest SciCheer, Allysen! She recently retired from the Arizona Cardinal Cheerleaders, and is now focusing on her startup business and charity work all while being a mom! What made you pursue nursing? I knew from a young age that I wanted to help people but I originally thought I would be involved in social or humanitarian work. I became a mom at a young age, and I decided that my career needed to not only be financially supportive but also make a difference in other people’s lives. 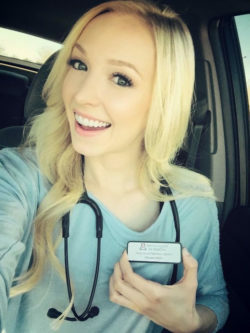 After seeing the many options that medicine and healthcare fields provide, I decided to pursue the highest degree in nursing and obtain my doctorate as a nurse practitioner. Nurse practitioners can work in many different specialties from hospital settings to family practice offices, so depending on your specialty, your work day will be very different. I am currently working on a few different jobs. I am in aesthetics and cosmetics, making sure people not only look but also feel their best. I promote healthy skin-care routines and offer a variety of noninvasive injectable treatments. I am also in the beginning stages of starting my own company to provide health care access to those in rural areas using telemedicine. And I am starting a nonprofit organization to provide support, resources, and guidance for teen moms, single moms, and their children. Considering I have multiple interests and invest my time in a few different areas, the goal of each job title that I’m pursuing is to help, support, and empower people, and empowered people can change the world! I want to use my career to improve the lives of each person I encounter. The only way I would be able to work in aesthetics, become an entrepreneur, start my own company, and to begin a nonprofit for young moms is through my education and life experiences. I want to use those experiences to reach people and in return better their lives and futures. My occupational field of medicine interprets my role as a nurse practitioner rather narrowly when it comes to telemedicine. I am hoping to develop technology to improve the accessibility, affordability, and convenience of quality healthcare to as many people as possible who have iPhones. I believe this approach will help revolutionize and accelerate healthcare by putting proactive options in the individual’s own hands. I am confident knowing that my contributions in their varying capacities will evolve, and I can positively impact other people’s lives and health. How have the qualities that made you a great cheerleader benefitted you in your STEM career? My willingness to step outside of my comfort zone; my desire to push myself and always be improving, embracing change; not being scared to challenge myself; being humble and knowing what I need to work on while also being confident in my current abilities; being kind and engaging to people I meet; and finally, never getting comfortable, always and I mean always showing up prepared, with a good attitude and ready to work. All those traits and qualities I used as a cheerleader, I still use today. How do you feel about challenging stereotypes? Redefining stereotypes is a life goal for me. Because I am a young single mom, a former NFL cheerleader, and also have my doctorate, there are many stereotypes that I continually encounter. I enjoy and jump at opportunities where I can educate and redirect someone’s viewpoints about NFL cheerleaders. As women who are capable and able to achieve and aspire to many different roles and titles, we must encourage others to understand and see women in more than just one role. Yes, I am a mom to two awesome boys, I am also a competent, well-educated, and successful healthcare provider, and also a former NFL cheerleader, and also a writer, and also an aspiring cook…Get the idea? You are not only one role, and the only way to break stereotypes is to continue to redefine them and allow yourself to grow to your maximum potential. My best experience thus far was graduating with my doctorate. Statistically, less than 2% of teen moms earn a college degree by age 30. Having the support, ambition, and ability to complete my doctorate has been by far one of the biggest sources of pride. Knowing that I am in a field that is highly sought after, and I did it with odds stacked against me, every sacrifice I made was well worth it. Surround yourself with women who you respect and who you want to become. Women can be strong, capable, smart, kind, and accomplished, having it all, doing it all, and being it all, all at the same time. The possibilities are endless, the future is bright, and you can and will do more than you realize. And remember, “those who say it cannot be done shouldn’t interrupt those who are doing it.” Don’t let people tell you no, because you are going to do it all! Truly, you are only limited by the extent of your imagination and ambition. Dream big, believe big, achieve big! And never give up trying. Never, ever give up. I love writing! I have written professionally for health websites and I am currently writing my own book. Pursue all your interests, you never know where they might take you!